Examples, solutions, and videos that will explain factors, multiples and prime numbers. 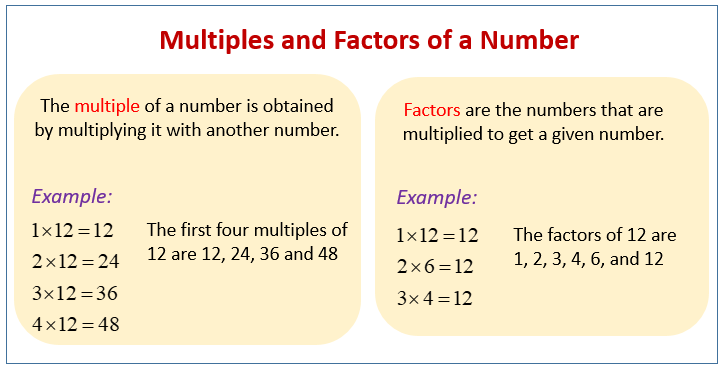 The following diagrams show how to find the multiples and factors of a number. Scroll down the page for more examples and solutions to find the multiples and factors of a number. In this lesson, we will learn about multiples, factors, and prime numbers. We will then explore how we can use these to find prime factors using prime factor trees. This video explores how many factors of a certain number are also a multiple of another number.